Last weekend I participated in a training day that was somewhat out of the ordinary with the NSW Rural Fire Service. The headline – learning about aircraft that the service uses, and how to work with them at an incident. It was a morning in the classroom, and an afternoon under the rotor wash of helicopters and watching fixed wing bombers. 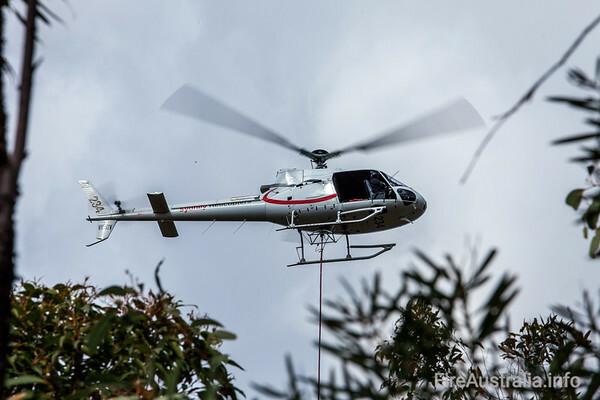 Aerial resources have become increasingly used and heralded for saving homes and lives while fighting Australian bushfires. This training was focussed on ground based firefighters who may call on these resources or work with them at a bushfire. 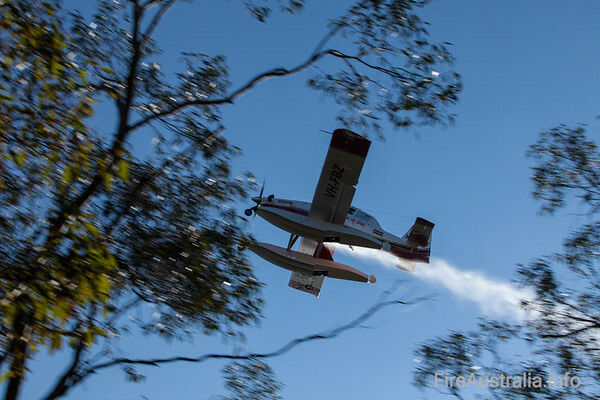 Through the training, a better understanding is gained of the various types of aircraft and firefighting agent (water/foam/retardant) used to monitor or fight bushfires. The practical training involved communicating with aircraft via radio to execute various ‘bombing’ missions, practicing aspects of the communication, drop types and effectiveness. On hand for the practical component were 3 helicopters and 2 fixed wing bombers. The helicopters landed at the training area and the pilots and crew interacted with firefighters on the ground, before taking to the skies. The fixed wing bombers were operating out of nearby Warnervale airport where another training day was taking place. 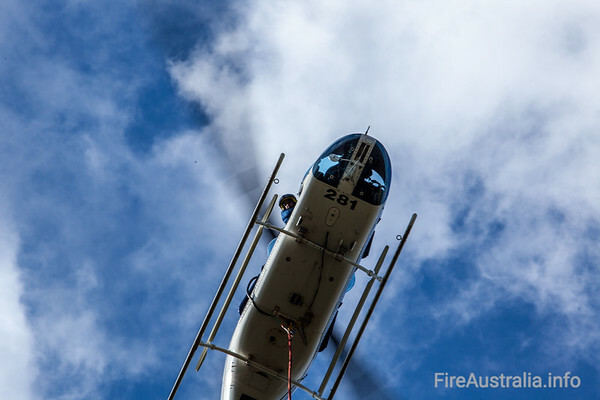 Helicopters used in firefighting are given callsigns according to the type of aircraft and the tasks it performs. On hand we had 2 helicopters designated as Firebirds. These are a lighter duty helicopter generally used for a mix of aerial observation, aerial incendiary deployment (igniting fires from above) and water bombing with under-slung buckets. 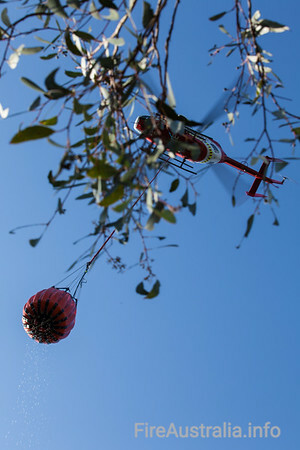 The third helictoper on hand was designated a Helitack. These are a medium duty helicopter, generally more focussed on water bombing with a heavier payload meaning a larger under-slung bucket or fixed belly-tank can be used. All 3 were utilising ‘Bambi’ buckets on a long-line. Fixed-wing aircraft (planes) are also given callsigns in the same fashion, and we had 2 Bombers on hand. Fairly straightforward, bombers are designed to ‘bomb’ the fire with water/foam or retardant. All 3 firefighting agents were utilised over several drops. Firebird 234 is a ‘squirrel’ – the colloquial term for an Aerospatiale AS350 helicopter. It’s operated by Sydney Helicopters and for those interested, the airframe was manufactured in 1980, an AS350BA model. Firebird 281 is a Longranger – Bell 206L3. It’s operated by National Helicopters and was built in 1987. 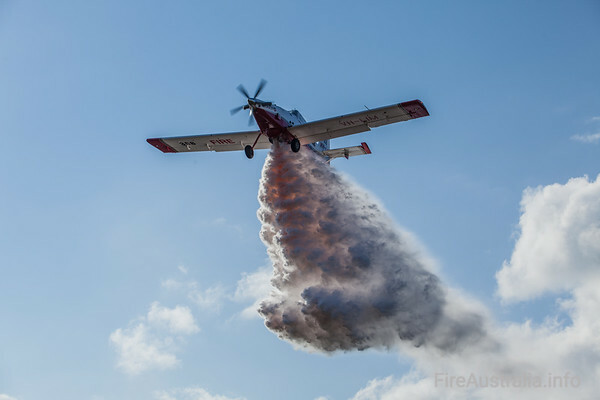 Helitack 201 is a recent acquisition by NSW Rural Fire Service who now own the aircraft. 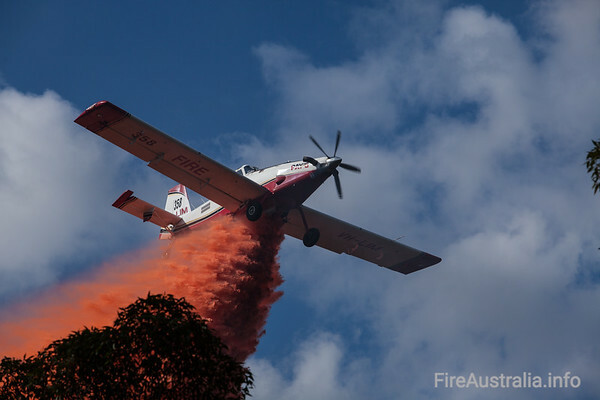 It was previously a joint NSW Police/Fire & Rescue NSW aircraft with callsign Polair 5/Fireair 1 (dependant on mission). 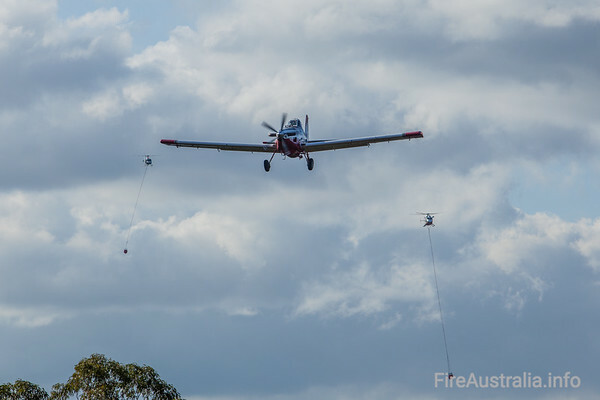 NSW RFS own the aircraft and it is maintained and operated under a contract by a private provider. The aircraft is a BK117B2, built in 1990. With this aircraft being twin-engine equipped, along with bombing and observation tasks, it also has a winching capability. NSW RFS utilise RAFT (Remote Area Firefighting Teams) and utilise this winching capability for deployment of crews into remote areas. It can also be used to assist the State Emergency Service in flood and other rescue missions. Along with the helicopters, 2 Pays Aviation operated fixed-wing bombers made several drops. Bomber 218 is a less common type, equipped with float skids which allow it to scoop water from rivers and lakes. This meant it was able to utilise the local waterways to greatly shorten the turnaround time between drops. Bomber 358 is a more common type, requiring a landing strip and ground crew to fill with water. This was undertaken by crews at Warnervale who were completing other training at the same time. The turnaround time for this was approximately 25 minutes. To get the most from the training, we utilised a number of ‘split-drops’ where the aircraft would drop only half its load of water on each drop and therefore save time for our training purposes.